While the default web browsers on most mobile phones are getting better, they still don’t compare to the best alternatives. Opera Mini is just such an alternative. It’s much faster than the default browser on most phones, and doesn’t take up a load of space. It renders just like you’d expect, too. Because it uses compression. Opera’s servers will receive your request for data and compress everything down to byte-sized pages, then send it over to you. Not only do pages load up much faster, but you also save on data costs (up to 80%). You can just tell that the Opera Mini team had usability and power in mind when designing the app. Zoom in/out with just a tap of the 5 key. 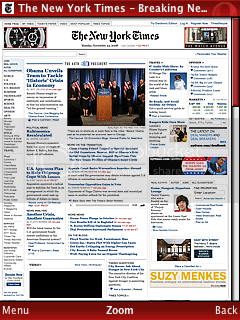 Auto-completion of websites you’ve already been to, plus one-click additions of “.com”, “.net”, etc. Adding of custom search shortcuts (e.g. Answers.com search). Speed scrolling support, press 2, 4, 6, 8 to scroll through pages very quickly. My only complaint is that it has no Flash support as of yet – but most Windows Mobile and Symbian S60 devices (Nokia E71 notably left out) can download Opera Mobile instead. If you’re using a Java-enabled device, do yourself a favour a try out Opera Mini. It works on Blackberry, too. A useful but often overlooked feature of the modern Macbooks is the multi-touch trackpad. This work horse is capable of recognising many gestures, including two-finger scrolling and tapping. Let’s bring that functionality to Windows. 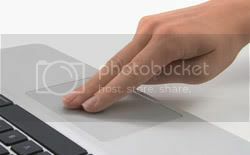 This is a mildly technical post detailing how to enable Macbook-like 2-finger scrolling on your Windows notebook touchpad. My Digital Life has outlined the way to do this. The process is pretty involved. 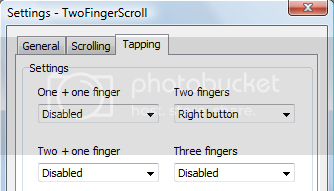 When you’re done installing the modified driver, you have to install an open-source program called two-finger-scroll. There is no software to install, just double-click the executable file. One last thing. 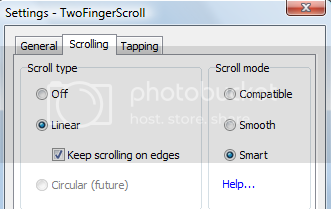 In order for two-finger scroll to work properly, you need to disable all 2-finger commands, and all virtual scrolling except for horizontal (you might want to keep this on, since two-finger-scroll doesn’t work horizontally.. Disable 2-finger commands by going to: Control Panel > Mouse > Device Settings > "Two Finger Gestures and un-checking “Enable two finger gestures”. Finally, disable virtual scrolling by going to: Control Panel > Mouse > Device Settings > Virtual Scrolling and un-checking “Enable vertical scrolling” and “Enable ChiralMotion scrolling”. 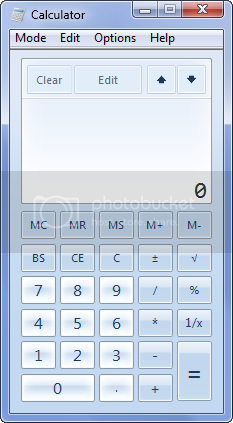 You can also enable a two-finger-tap to mean a right click using the same application. Here are the settings I’ve used. Disclaimer: Try this at your own risk. It worked for me, but it might not work for you. Whatever happens, I’m not responsible. Thanks! It’s not often that I showcase another site around here. It has to be really special, really unique, and really different. 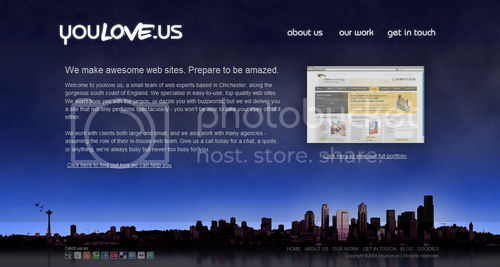 Website design company YouLove.us checks all the boxes. 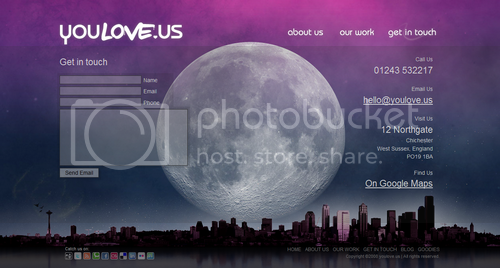 The site is beautifully arranged over a city scape, with a giant scrolling background sky. The content is in the “sky”. Different content is laid out on different portions of the sky. The intro page is against an early morning sky, the about page is set against sunrise, and so on.